Jeffrey A. Smith, founder and president of JASCO Realtors announced today the merger of JASCO Realtors with the Keller Williams Realty Memphis office to create one of the largest real estate brokerage offices in the Mid-South with over 300 agents. Smith will join the leadership team, overseeing operations under the Keller Williams brand. Keller Williams is the world’s largest real estate franchise by agent count with more than 980 offices with 190,000 associates and is number 1 in units and sales volume in the United States. "We’re very excited to announce the merger of JASCO Realtors and Keller Williams Memphis, with Jeffrey Smith as a KW leader,” said David Osborn, Keller Williams Operating Partner and Regional Owner. Inspired to ﬁnd a method to overcome the compensation hurdles faced by all real estate agents and small business owners, Smith founded JASCO Realtors in January 2015. 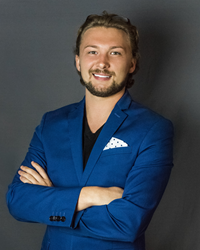 When he started JASCO, Smith became one of the youngest real estate owner-brokers in the United States. Run in the mindset of an agent, his innovative firm has grown from three employees to over 115 with five Memphis-area locations and one in DeSoto County, Mississippi in three short years. Smith believes that by treating both the agent and the client well, the ﬁnal result is proﬁtable for all concerned. His commitment is to help agents excel in their business and do more for their clients and the community. “I can’t thank the team at JASCO enough for their dedication and commitment to our trade while serving the community. I started JASCO to create a solution for the success of agents and their clients. As a team we helped bring that solution to fruition and now with the resources of Keller Williams, the world’s largest real estate franchise, we can continue to provide a great solution for agents and clients alike throughout our market. I know I speak for the entire JASCO team when I say we are excited to get to work with Keller Williams Memphis and look forward to many great successes together,” said Jeffrey A. Smith, founder of JASCO Realtors and KW Leader. Austin, Texas-based Keller Williams, the world's largest real estate franchise by agent count, has more than 980 offices and 190,000 associates. The franchise is also No. 1 in units and sales volume in the United States. In 2015, Keller Williams began its evolution into a technology company, now building the real estate platform that agents' buyers and sellers prefer. Since 1983, the company has cultivated an agent-centric, technology-driven and education-based culture that rewards agents as stakeholders. For more information, visit kw.com and kwworldwide.com.